Hanna Barbera/Turner/Ruby Spears. All WB properties. About half the Horror Savage World figures, Thundercats, Mortal Kombat, and DC are WB already. WB properties so far account for most of the line. Thundarr the Barbarian. Mighty Mightor. Space Ghost. Dragon’s Lair. Centurions. Mr. T.
DC Fantasy. Possibly as a non-retailer specific Savage World expansion. Again, WB. Might go well as Funko Shop/Diamond wave. Warlord. (The original MOTU style Warlord from Remco is quite a collectable.) The Demon. Amethyst. Kamandi. Atomic Knight. 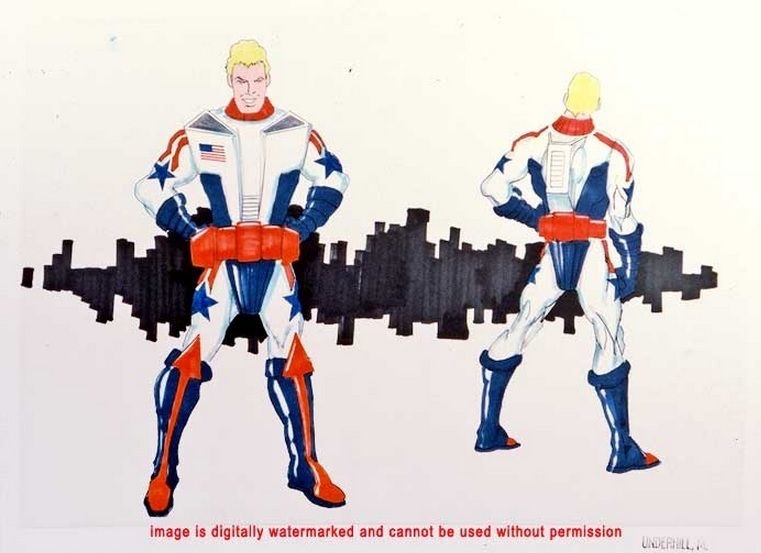 (AK was planned as a Super Powers release and has an unused 80s toy costume. In the comics, he rode a giant mutant Dalmation.) Zari (DC’s current name for its Isis character, which had a Filmation show. She tends to run with the Shazam characters who have a bit of a MOTU flair and inspired MOTU in key ways). Wonder Woman and the Star Riders. Aborted She-Ra competitor. Most of WW’s friends are new characters. They debuted in continuity just a few years ago. Bravestar. Blackstarr (the proto He-Man cartoon). Breaking Bad. I’ve got some ideas for how you adapt the characters. Gus Fring as half-Skeletor. Saul Goodman with a blue remembrance ribbon chest harness and loud neon leopard fur trunks/boots with a cell phone sword. Walter White as a pastiche of Crystar, the blue crystal fantasy toy hero owned by Marvel. I’d suggest giving Walt two figures: the blue crystal Heisenberg and mild mannered Prince Walt. Of course you frame the toyline as a resource battle (ala Transformers and Energon) for the Canyon of the Blue Crystals. Action Shakespeare. Double mashup. Classic action heroes as Shakespeare characters as fantasy barbarians. Nod and wink to Arnold’s Hamlet from Last Action Hero. Maybe a Stallone Caesar, Bruce Willis Prince Hal, Dolph Lungren Titus Andronicus (Folks always wanted Dolph in this scale because of the He-Man movie). Connery MacBeth. Cheers. Yes. Cheers. There seems to be a nostalgia resurgence for Cheers. Broad characters, easily adapted. The hard ones to get, Cliff and Norm, just signed off on Mego dolls. Frasier as a mentalist/magician type. Norm as a hearty warrior. Cliff as a gadgeteer. Sam and Diane as the He-Man and Teela (Sam gets a baseball bat club). Ghostbusters. They’ve been signing off on odd licensed takes and crossovers lately. Stranger Things mashup merch. Ninja Turtle Ghostbusters. Barbarian Ghostbusters feel like a natural for the line and a counterweight against the all-villains horror wave. Proton swords. And while we’re at it, reach out to Dan Harmon (and Sony) to see if he’s actually doing a Community movie because he’d probably write a MOTU pastiche in if somebody pitched a toyline. And a toyline would only happen with a movie. You could probably get a Rick and Morty small wave in at the same time for synergy. Xena: Warrior Princess for me! Amethyst is a great suggestion. 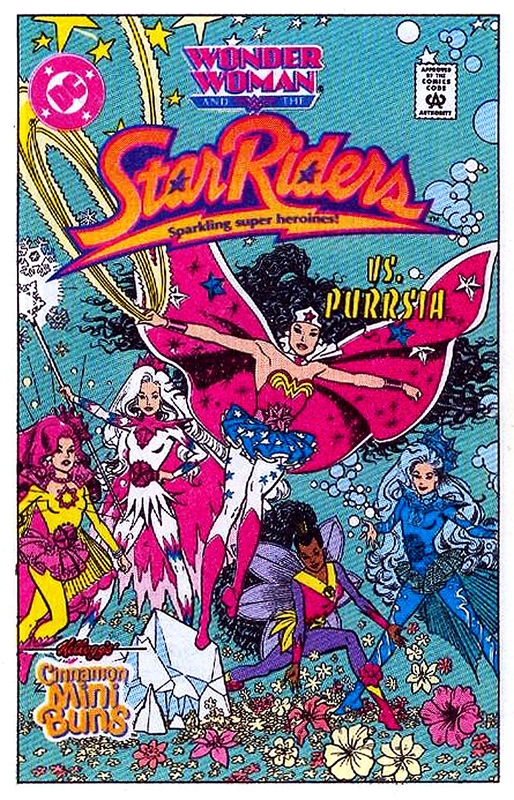 I like the idea of Wonder Woman and the Star Riders too! That could be cool. It's a shame that Super7 has the licence for She-Ra as I'd love to see the She-Ra characters in Savage World. Steve Trevor had an usused Super Powers design. Might be kind of cool to make him the equivalent of Bow from the She-Ra line. Pretty sure DC owns all of these designs as Mattel was able to produce other unmade Super Powers figures and at least one Star Rider showed up in continuity a few years back. And that’s Dolphin of Aquaman fame, Ice Maiden of the JLI, Starlily (the one I think newly debuted a few years ago), and Solara. There was also a Supergirl design. My recollection is that the belts could be used as rings. Savage world bugs bunny and daffy duck. Agent 86 wrote: Xena: Warrior Princess for me! Whaaaat? I am so happy with what Super7 is doing with She-Ra! But aside from that, does Super7 hold an exclusive license? I know they both make MOTU, Hellboy, etc. Maybe they both have rights to make She-Ra? xmaldigolax wrote: Whaaaat? I am so happy with what Super7 is doing with She-Ra! It's the online exclusivity and high prices (especially when factoring in international shipping) that I don't like about Super7's figures. I'd buy all of them, but not at $34 (AUD) plus shipping per figure. My impression is that S7 is low volume. From what I gather, they have about 15 employees and production runs around 10,000. Funko is 10-20x the size all around so they run better production costs. The Savage World MSRP is $15. But it gets discounted to $10-12 or less because it gets offered at a big discount to retailers to begin with thanks to low production costs from high volume runs. The S7 MSRP on vintage is $20. And $5 makes sense because of the more involved leg tooling artificulation and springloaded punch. But these rarely get discounted because the cost per unit is high because the production run is low. I doubt S7 would give up MOTU exclusivity. Other Filmation properties like Bravestar and Blackstarr might be open for Funko. The buzz as I’ve heard it is that Mattel sold its stake in He-Man to Dreamworks or Universal sometime back. Much like how Star Trek’s rights are split between CBS and Paramount (but CBS typically manages Paramount’s licensing), MOTU is split between Universal (toyline), Dreamworks (cartoon), and Warner Bros (Lundgren movie). Dreamworks and Universal bundle their rights cooperatively to licensees. They license the toy rights to MOTU and She-Ra back to Mattel who sublicense to Super7. Mattel’s license expires in 2023. 1. To cut a deal with Super7. 2. Wait until around 2023 (or sooner if Mattel and/or Super7 go under) and make a better bid on the license. 3. POSSIBLY do Lundgren movie figures under license from Warner Bros., who have been the licensee for 80% of the SW figures. This would ONLY include movie characters and characters used would have to be 100% derived from the movies and not anything original from older figures or minicomics. This probably involves paying the actors as well. Lundgren and Langella would be easy sells based on interviews. I guess the question then becomes whether you’d think they needed a Courtney Cox figure. “Lord of the Rings” and “Clash of the Titans” are two properties that would be fun to see in Savage World. The Primal DC figures inclusion of beasts and a play set really has me wishing! It would be really cool to have some kind of Mordor set with Mt Doom and the tower with the eye of Sauron overseeing everything. A Balrog or Kraken would be cool as a beast figure. Pegasus, Medusa and Cerebus. Hobbits, Dwarves, Orcs and Elves. These would all be great! NOOOOOOOOOOOOOO I hate the words "super7 go under! My favorite indie toy company! I give Mattel worse odds than Super7. But it could mess with Super7 if Mattel went under if S7 is “subletting” rights from Mattel or using Mattel for concept art or prototyping or molds. ah yes. i see what you mean. that would affect Four Horsemen as well since they do the actually sculpting and such. Cascading effects. I really hope that doesn't happen. The Horsemen have side projects and some relationship with Hasbro as well, don’t they? I think Super7 is SO small that it would take less to keep them going. What worries me about Mattel is that their new retail product isn’t getting stocked and their con appearances are heavy on concept product with no release planned, which seems to me like what you do when you’re looking for investors or a buyout. I blanked on that and then came here JUST NOW to post the same thing. Now... Would you prefer a straight take like Thundercats and Mortal Kombat or a fantasy-style take like DC Primal Age and Savage World Horror? A part of me WANTS the weirder take or to at least go for the weirder side of Joe rather than the O13 + Sunbow main cast that would be obvious. Because the weird guys would fit on a 5.5 shelf better. So... I’ll go with a DIC era tribute because I think those designs translate better to 5.5. Battle Armor Cobra Commander (it just looks better IMHO with squat pose). I’m NOT gonna say I’m against Sunbow or classic looks but I think the DIC era just lends better to 5.5 style sculpts because of the armor and colors and would create more of a WTF buzz factor. It would stand apart from other Joe nostalgia products. IMHO part of nostalgia marketing is hitting people up for the stuff they see less of right now. Then go back and do Sunbow later as the following waves. If anything could get a 4+ wave commitment here, it ought to be GIJoe. Now that there are no licence limitations standing in the way, it's got to be Xena: Warrior Princess, as a minimum including Xena AND Gabrielle! Agent 86 wrote: Now that there are no licence limitations standing in the way, it's got to be Xena: Warrior Princess, as a minimum including Xena AND Gabrielle! It’d be nice to see more female characters. The Chun-Li they showed at Toy Fair is one of the best female 5.5s I’ve seen. I assume they’d put Xena in a wave with — uhm, memory issues — Hercules and Hades? Does anyone know if Conan the Barbarian is still going to happen? I’m just having a tough time getting excited about the new stuff if it means that Conan is swept aside. Cobrala Commander wrote: I assume they’d put Xena in a wave with — uhm, memory issues — Hercules and Hades? If it was a shared Xena / Hercules themed wave, then I'd expect to see: Xena, Gabrielle, Hercules, Iolaus, Ares and Callisto. Ares was one of the major villains on Hercules and her was a regular antagonist on Xena. Callisto was one of the major villains on Xena, but also appeared on Hercules. So, the fact both villains have cross-over appeal make them pretty suited for a shared wave. As for Gabrielle and Iolaus, well you can't have the heroes without their sidekicks. And I think the "Savage World" aesthetic leaves enough room for both of their otherwise potentially ... bland designs to be given a significant boost. bgiles73 wrote: Does anyone know if Conan the Barbarian is still going to happen? I’m just having a tough time getting excited about the new stuff if it means that Conan is swept aside. I believe Reis at Funko said last November that Conan was penciled in for October 2019. Thanks for that little bit of info- I had not heard anything since they were presented at last year’s Toy Fair.